A multicultural primary school in South Lakeland has used the outdoors as a tool to overcome the language barrier. St Cuthbert’s Catholic Primary in Windermere has the county’s highest number of children for whom English is their second language. 60% of pupils are from Eastern European countries such as Poland and Romania. 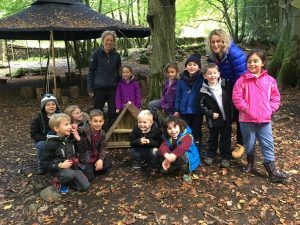 The school’s parent-teacher association received £1,500 from the Holehird Trust to take 30 pupils to the Footprint Project in St Catherine’s Wood, Windermere to experience outdoor learning. The project, which is run by the National Trust, focuses on inspiring children through the exploration of their natural environment. The interactive sessions were developed with the aim of encouraging inclusion and developing language and social interaction within the group. Activities included bushcraft, animal tracking, exploration and art. The children created a collective artwork made from natural woodland materials that was then displayed in the school’s outdoor play area. 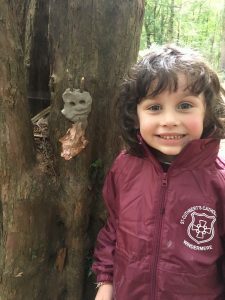 Simone Backhouse, Chair of the Parent Friends of St Cuthbert’s Catholic Primary School, said: “The pupils get so much more from being able to do something hands on, in an environment where everyone can see, smell, hear and discover from their own perceptions. “A number of the children have recently arrived in the UK with little or no English. Their experience during this project has had a great impact on their confidence in a group and has helped create a feeling of belonging to their new home. The language barriers have been overcome using sensory and visual clues which cannot be reproduced so easily in the classroom.